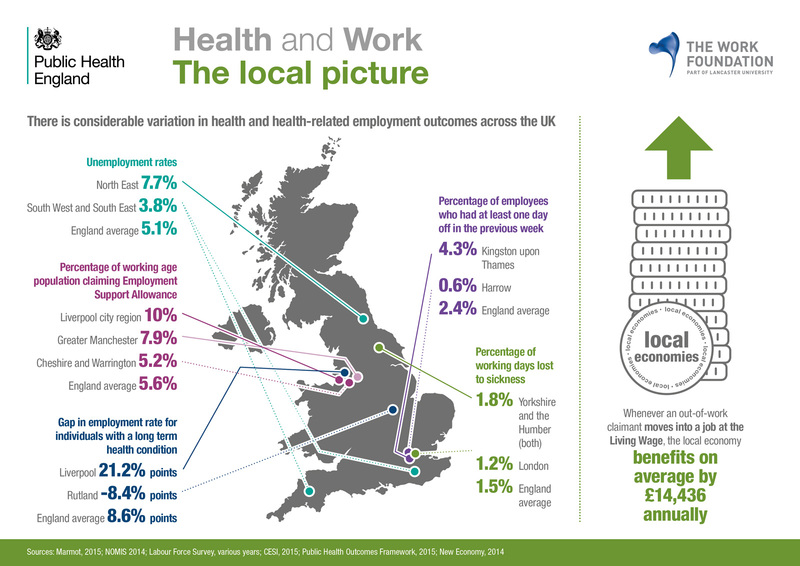 There is considerable variation in health and health-related employment outcomes across the UK, according to research undertaken by The Work Foundation. The North East, for example, shows the highest percentage of unemployment rates – 7.7% compared with a South West and South East rate of 3.8%. Meanwhile, Liverpool has a higher than England average percentage of working age population claiming Employment Support Allowance (10% compared with 5.6%). The most notable statistic, however is Liverpool’s percentage of individuals experiencing a gap in employment due to long-term health conditions: England’s average is 8.6% points; Liverpool’s is 21.2% points. When it comes to work-related illness, the UK as a whole is performing well when compared to other EU countries, with relatively low rates of work-related fatalities, injuries and ill health. “European surveys reveal that the majority of UK workers are confident that their job does not put their health or safety at risk. Additionally, UK businesses are more likely to have a health and safety policy, and to follow this up with formal risk assessment, compared to other EU countries. “It is important to understand that it is not the geographic area in which someone works which is the primary driver of the degree to which they are at risk of adverse health and safety outcomes such as ill health or injury. The primary driver is a person’s occupation, with the industry in which they work also having an effect. Therefore, any apparent difference between regions and countries will be affected by the occupational mix in the workforce of those regions and countries.